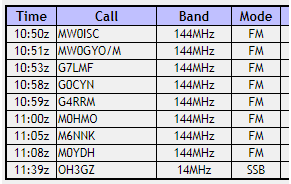 M0PLA/P SOTA Activations: 20th Jan 2018. G/WB-003 SOTA Activation visit. 20th Jan 2018. G/WB-003 SOTA Activation visit. Grid SO 367986, Altitude 536M. It has been 5 months since my little rush into hospital with multiple blood clots too both lungs. My health has returned enough for me to take in a few smaller summits. I had planned to visit 2 today but luck was against me with snow and ice. G/WB-005 was closed at the bur way. So we went around the Long Mynd to the Stiperstones as this was our planned second summit. I had Jamie (M6SZF) with me in the car, (John) M0JZH and (Simon) G0UFE two very good friends of mine followed in Simon's car, they didn't want me to push myself too hard so they wanted to accompany myself and Jamie to make sure I didn't? or was it the debrief in the pub afterwards? We shall never know lol. We parked at the usual car park GD SO 36943 97704 at around 10:05 a.m. and started our slow walk up. We managed to arrive at the summit, setup and start operating by 10:50 a.m. I chose my Yaesu FT 270 Hand held for 2M FM, john was using 2M ssb and Simon 20M ssb. Jamie was our resident photographer as usual but decided on long range shots, you can see we had a little snow which made a very cold activation but our spirits were high, or would be after the debrief lol. We managed to log 4 or 5 of our own club members TDARS (Telford & District Amateur Radio Society) they were there for long range support lol. A quick thank you to Jamie, John and Simon for assisting me in returning to my favourite activity SOTA.